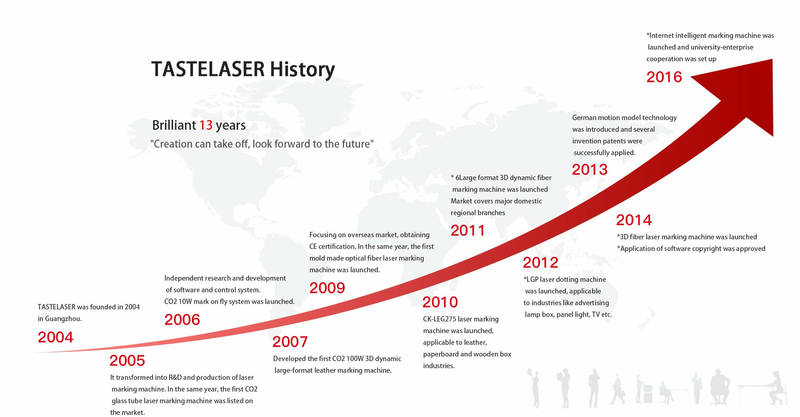 Located in Guangzhou, TASTELASER team devotes itself to R&D, production and sales of high-end 3D optical fiber, high power CO2 and ultraviolet laser marking machine to meet the market demand of advanced marking machines. With the development of laser marking technology, we are the market leader in 3-axis dynamic focus technology, realizing remarkable mark quality in optical fiber, CO2 and ultraviolet laser marking system. TASTELASER marking system fuses the industry experience and application knowledge for years. Under the major environment of “intelligent manufacturing, industry connotation becomes the key to enterprise survival. TASTELASER has profound experience in industries of leather, paperboard, textile, mobile phone, smart home and LED lighting etc. with sky-high equipment market share. Having proprietary intellectual property rights for software and mechanical design, plus many years’R&D experience in the field of laser marking machine, we are possessed with profound theoretical knowledge and relevant accumulation with process experiment background in fields of laser marking, laser processing and laser engraving etc. Our innovative products are not only able to meet many present demands for customers in manufacturing and research industries, but also satisfy their future demands. The sales volume of new products continue to grow, accounting for 30% of the total sales, indicating our outstanding capability in developing new products and quick response of customer demands. The strategic enterprise technological cooperation with industry giants like ROFIN and IPG Photonics etc. has provided deeper and microcosmic technical support services to our company. We have also become a member of Guangdong Laser Industry Association, Guangdong Mechanical Skill Alliance, Guangdong Pilot 100 Young Leading Enterprise and best partner of ROFIN in China etc. 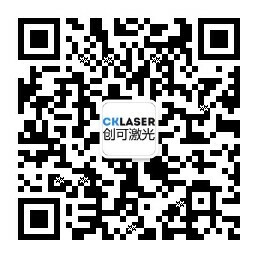 In 2015 TASTELASER cooperated with Guanggdong Machinery Technician College and South China Normal University and became a reliant unit with Ministry of Education for a combination involving production, teaching and research for laser processing technology in Guangdong with powerful technical research backup force. By adopting the optical design of front focal type with coordination of galvanometer, the 3-axis dynamic focusing system is designed by software. 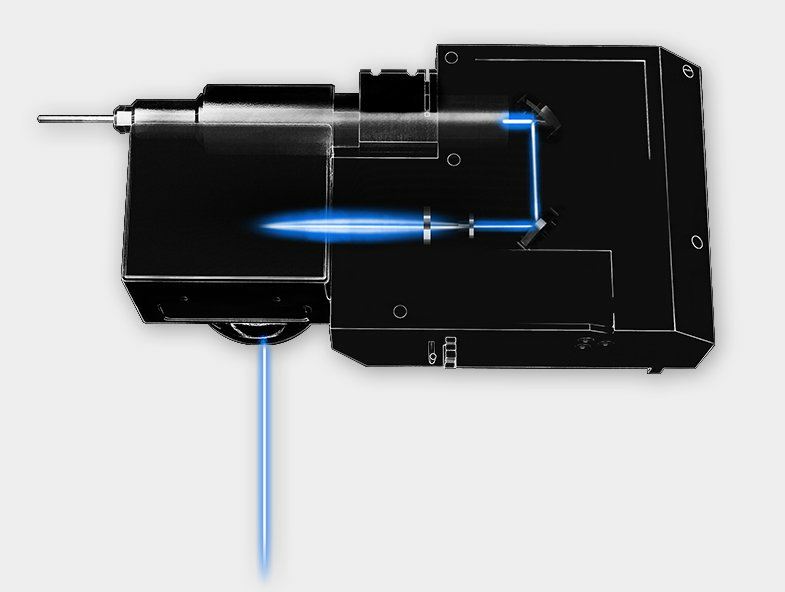 Compared with the back focus type, facula output by laser is focused through the dynamic focus lens. The focal distance of focus lens is changed with software algorithm on the basis of each point on the workpiece plane to the focal lens to guarantee that the focused light spots are all focalizing in the plane where workpiece is located. With such optical design mode, the marking speed can reach up to 1500mm/s, increasing by almost 40-50% in comparison with the marking machines adopting back focus mode in the market. 3-axis marking solves difficulties of traditional laser marking on targets such as step surface, slope, cylinder, circular cone etc., keep the font distortion all the same. 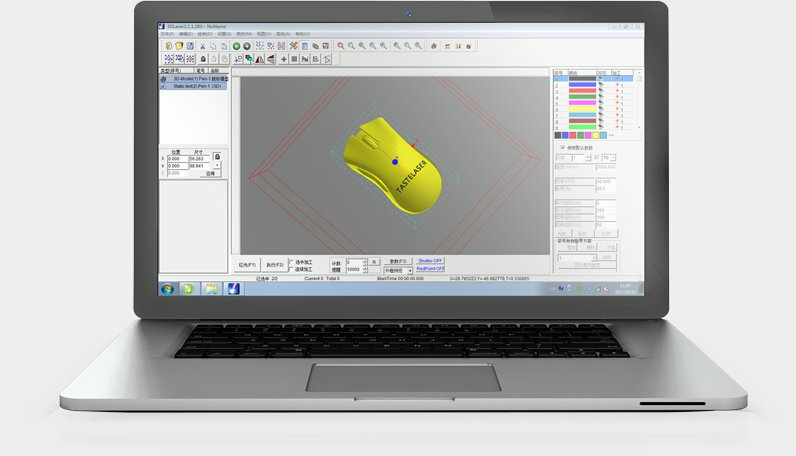 The user friendly operation interface of our 3Dlaser software kit makes operation flexible and gradually offers feasibility of efficient flexible processing.